Home » Aesthetic News » Skin Care » What Is the Best Filler for Lip Augmentation? According to the American Society of Plastic Surgeons, more than 27,000 women had lip augmentation procedures done in 2016. That’s a 43% increase from 2000. There are many forms of lip augmentation, and which one will be right for you depends on how you desire your lips to look — more pouty? less wrinkled? — and the recommendations of an experienced plastic surgeon. There are a number of effective lip fillers out there, each with its own advantages. See below for the lowdown on the best lip fillers. Hyaluronic acid is very common for lip augmentation, and can be found under many brand names. Some of the more popular ones are listed below. This is a hyaluronic acid filler that adds a more subtle volume to your lips while smoothing away vertical lines. This creates fuller lips while eliminating the lines often associated with aging. Hyaluronic acid, by the way, is a substance the body produces naturally, so it’s completely natural and not an artificial material. This is another hyaluronic acid filler developed by Teoxane Laboratories. This filer is known for reshaping lip contours, increasing lip volume, and rehydrating lips. Since Teosyal Kiss is more viscous than some other brands, some patients may notice a smoother look. 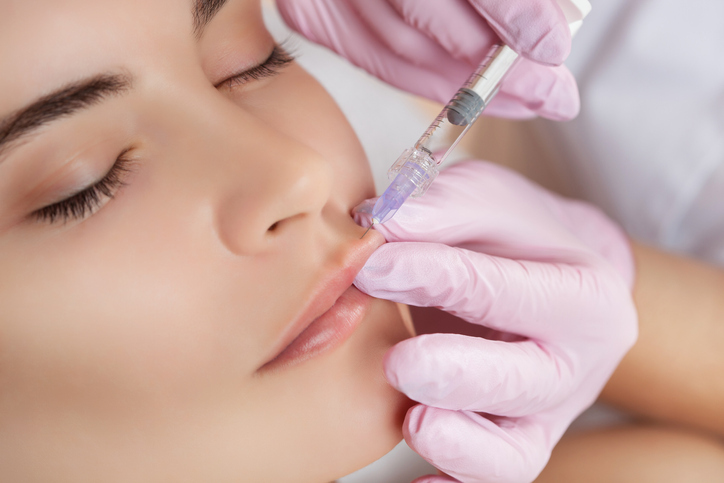 The filler has also been modified a bit to include less protein volume and added bacterial endotoxins to reduce the risk of side effects. Here is yet another hyaluronic acid filler that has been in the market and approved by the FDA since 2003. This brand is known for its long-lasting results, usually lasting upwards of six months to a few years. If you are dissatisfied with the results, the cosmetic surgeon can add an additional enzyme filler to quickly return your lips to normal. This is commonly referred as Lipoinjection. As suggested in its name, this is a method where your own body fat is used as the filler. Fat from your body is removed and purified. The process is very intricate to ensure the fat cells remain alive during the process. The fat is normally taken from the face, such as the cheeks or temples. Collagen is a natural protein produced by the body. Collagen, in fact, is a staple ingredient in many anti-wrinkle creams. Like fat, collagen can be used as a filler to enhance the shape of your lips. The effects of collagen injection, though, only lasts for about three months before they must be reinjected. Under PRP augmentation, your own blood is drawn, treated, and injected into your lips. Since it involves blood, the method is also colloquially known as a vampire lift. The procedure lasts upwards of one year. While PRP injection is common for use in other parts of the face, it is less so for use in the lips. To get the results you want, choose Dr. Thomas W. Loeb for lip augmentation in Manhattan. Make an appointment for a one-on-one consultation with Dr. Loeb in which you can discuss your aesthetic goals and learn about which cosmetic options are right for you.